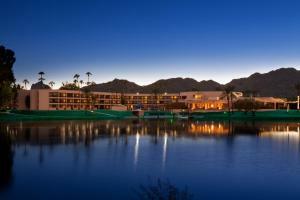 This delightful Scottsdale resort is situated within 40 landscaped acres in the shadow of the famous Camelback Mountain. Enjoy fun and relaxation while soaking up the Arizona sun. The rooms are fitted with a TV with cable channels. All suites include a seating area where you can relax. All rooms have a private bathroom. Extras include bathrobes and free toiletries. Scottsdale Plaza Resort features free WiFi throughout the property. The Scottsdale Plaza offers the discerning guest a variety of deluxe accommodations. Take a swim in one of the 5 swimming pools or be pampered at the day spa. The day spa and salon are open Monday- Sunday. Exciting recreational activities are located on-site. Lighted tennis courts, a PGA Grade putting green and free fitness classes are available for all resort guests. OdySea Aquarium is 5 km from Scottsdale Plaza Resort, while Desert Botanical Gardens is 9 km from the property. Scottsdale Airport is 9 km away. 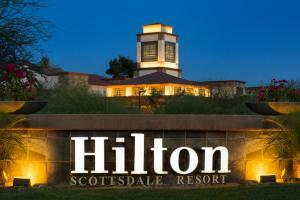 When would you like to stay at Scottsdale Plaza Resort ? This quadruple room features a cable TV, bathrobe and air conditioning, as well as a refrigerator. This double room has air conditioning, cable TV and bathrobe, as well as a refrigerator. This double room has a bathrobe and air conditioning, as well as a refrigerator. This villa has air conditioning, a bathrobe and a refrigerator. This double room features a bathrobe, air conditioning and cable TV, as well as a refrigerator. This quadruple room has a bathrobe, air conditioning and cable TV, as well as a refrigerator. This family room has air conditioning, a refrigerator and cable TV. This suite has air conditioning, refrigerator and a cable TV. This suite has a sofa, air conditioning and seating area. Guests are required to show a photo identification and credit card upon check-in. Please note that all Special Requests are subject to availability and additional charges may apply. Pets are allowed (dog/cat less than 50 pounds) for an additional fee per stay per pet, up to 2 pets per room. Contact the property for more information. Each day we'll check prices and send you an email for your selected dates at Scottsdale Plaza Resort. If you don't have specific dates but would like to check prices for say next weekend or say next month we can check the price too. Click to write a review and share your experience of Scottsdale Plaza Resort with other travellers.